Baccarat is one of the two most popular card-based casino games in the world, and it has a considerable amount of depth considering it’s largely chance-based. The game of Baccarat has a very interesting history that’s important to understand because it sets the context for how the game is played today, both online and in land-based facilities. Before online gambling became popular, it was only played for high stakes, and it was known as a game off limits to all but the social and business elite. It was rare to see a game where the minimum bet per hand was less than $1,000, and even today, it’s a favorite of high rollers. If you want to get in on the action with this game, there are two approaches. One approach is to simply learn a straightforward, boring strategy and play that without actually understanding what’s going on in the game. A better approach is to follow along, learning the rules of the game. This will allow you to put more advanced and interesting strategies into action, making your experience much more enjoyable and boosting your chances of having a better payout rate. 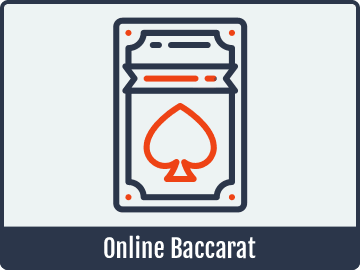 Players who are looking for where to play Baccarat online will have a lot of different options since it’s a standard game played at most online casinos. Generally speaking, the main differences between different online Baccarat games will be that some of them have extra side bets and some of them have better odds on bets that you wouldn’t be taking anyway, like the tie bet. This is essentially to try to entice players into taking a bet with a high house advantage while mistakenly thinking it’s a reasonable option. The best online Baccarat sites will actually be those that have strong graphics with good promotions for the game. At the very least, you want to earn loyalty club points or other comps while playing online Baccarat for real money so that you’re chipping away at the house advantage as much as possible. The same principle goes for people who want to play mobile Baccarat since it’s essentially the same game in a different interface without anything in particular that makes it stand out in terms of giving players a different experience. Baccarat can be played with any number of decks, but it’s normally played with six or eight. The value of the cards are such that the ace is worth one, the two is worth two, the three is worth three, etc. The ten, jack, queen and king are all worth zero or ten, it doesn’t matter which, as you’ll see shortly. Thinking of them as zero is probably the simplest option. Players start off by making their bets, which we’ll detail below. Then, no matter how many players are at the table, two hands are dealt. These hands are called the “banker hand” and the “player hand,” though players can actually bet on either. A series of actions are then taken by the dealer following a specific set of rules for determining the winner between the two hands, and then the bets are paid based on the outcome of that series of actions. The players don’t actually make any decisions during the play of the hand at all. Instead, they simply watch the play itself unfold. A big part of learning how to play Baccarat is learning how the hands are scored. In this game, the value of each hand is based on its “ones” digit of the total cards in the hand. For example, if the cards add up to 28, then that is a score of 8 because the “ones” digit of 28 is 8. This can be confusing for new players who can’t understand why a score of 17 lost to a score of 8, for example. If the banker has 6 and the player has 8, then the player wins with the higher score. If the banker has 15 and the player has 25, then it is a tie since they both have a score of 5. If the banker has 16 and the player has 24, then the banker wins with a score of 6 over the player’s score of 4. This is very intuitive once you get the hang of it, but if you’re more familiar with blackjack, you might find yourself making mistakes out of the habit of using that game’s scoring convention instead of the one used in Baccarat. That’s something to look out for when you’re learning this game because it’s a very thematic mistake. After the bets are made, two cards are dealt to spots on the table marked “player” and “banker.” These are the player and banker hands, respectively. If either of these Baccarat hands score as an 8 or 9, then the hand stops immediately and a winner is determined. This rule helps the game to progress quickly as one of the reasons for this rule. If neither score 8 or 9, then attention turns to the player hand. If the player hand score is five or lower, then the player “hits” and gets one additional card. If the player hand is six or seven, then the player “stands,” and the banker gets a chance to hit if its total is five or less. Baccarat dealing is pretty easy to understand up until this point, but this is where things get a bit complicated. If the player hand hits, then there’s a somewhat complicated set of rules to determine if the banker hand hits, and we’re going to break that down in the following chart. If the player’s third card is this… Then the banker hits with a score of this or higher. Essentially, if the player hits, then the decision for the banker to hit is based on the banker’s score and the value of the player’s third card. It’s a little complicated, and it’s not necessary for players to memorize this chart since the dealers will know it as a part of their training. There are three bets that are considered the “core” Baccarat bets, and every single style and variation of the game will have these three bets available in some form or fashion. The tie bet is really easy to understand. If both players end up with the same score, then the tie bet wins. It normally pays at a rate of 8:1, meaning if you wager $10, then you’ll be paid $80 when you win. Unfortunately, it’s also a complete sucker bet at these odds with a very high house advantage (see the charts below). The player bet is also easy to understand. If the player hand wins, then bets on the player hand win. The player bet pays at a rate of 1:1, so a $5 bet gets a $5 win. This bet always has a very, very low house advantage, but it’s typically just slightly worse compared to the banker in most variations of the game. Finally, we have the banker bet. This is traditionally the best wager that you can make in the game, normally coming in just slightly better than the player bet. You win on this wager if the banker hand wins, but it pays 0.95:1 instead of 1:1. This means that on a wager of $100, winning with the banker hand pays you a profit of $95. This wager is based on a 5 percent commission, and depending on the house rules for how this commission is handled, you may have to use specific bet sizes to avoid issues where your payout rate isn’t as good as it could be. A wager that you’ll see available in some games that’s not a part of the major three bets is called the pair bet. This allows you to bet that the first two cards of either the banker or player hand (you pick one or the other; the wager is not on both) will be of the same rank. Unfortunately, this option is also a sucker bet much like a bet on a tie, and it frequently has a house advantage of more than 10 percent. The following is the house advantage for the four Baccarat bets that we have outlined above. The house edge itself will depend on the number of decks you’re playing with, but the changes are subtle from one number of decks to another. As you can see, the difference between six decks and eight decks, the options that you’ll see virtually everywhere, is minimal. In fact, it doesn’t change very much at all for the bets that most players should be making (the banker and player bets). Baccarat is the second most popular casino card game in Western countries, and it’s the top most popular casino card game in Eastern countries. It’s a very social game where players have plenty of time to make friends and chat each other up as the game progresses. It’s also fairly simple to learn to play, but once you get to know the rules on a more in-depth level, then you can start to see some of the complication that comes with it. Overall, it’s a staple in virtually every casino, online or land-based, in the world, and this simplicity with an underlying degree of depth is one of the main reasons for its enduring popularity.